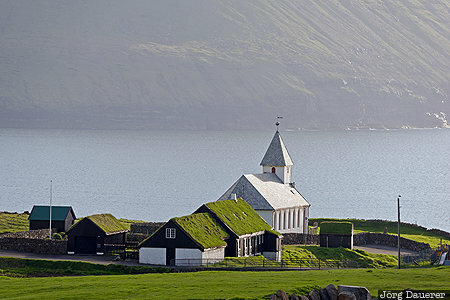 The church of Viðareiði and the grass roof houses of the village in front of the North Atlantic. The island Viðareiði is part of the Northern Islands, Faroe Islands. This photo was taken in the evening of a sunny day in June of 2017. This photo is in the Photo Calendar "Färöer Inseln". This photo was taken with a digital camera.